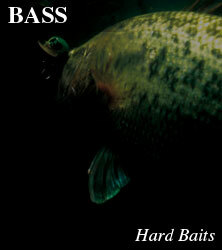 Any angler tries to avoid snags by switching to Texas rigs or rubber jigs around weeds, reeds and lay downs and other shallow cover, however WORMING CRANK SHOT is the hard body to take on structure speedily and effectively while maximising the potential fish appeal found only in hard body lures. This is the lure for big fish. Use 12 pound line rigs and pitching or circle casting to get WORMING CRANK SHOT right up the back of the weed. In thin areas of weed you reel the lure in, and when it gets thick simply pull the lure through the weed like you would drag a plastic along the bottom. It may look like a high pressure lake lure with a small body, however as the lure goes through weed it bounces off structure and entices bites, which is why it is fitted with an oversize hook to securely catch any bites. Once you feel the bite, set the hook and yank the fish into open water. If you can do that, then you would have mastered the WORMING CRANK SHOT style. Catch fish that nobody else could until now. Copyright 2013 Marukyu Co., Ltd. All rights reserved.